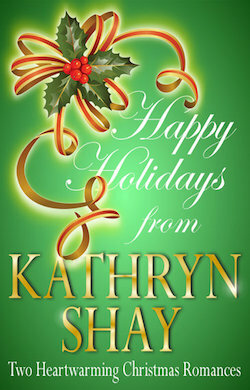 As a holiday gift for her readers, Kathryn Shay offers two of her most popular backlist books, HOME FOR CHRISTMAS (formerly A CHRISTMAS LEGACY) and BECAUSE IT’S CHRISTMAS at nearly half price. Follow a high powered CEO and a high school principal as they learn the true meaning of life and happiness through the women they love. HOME FOR CHRISTMAS: Jay Lawrence returns to his hometown after the death of his estranged father. To receive his inheritance, he must destroy all the dreams of bookstore manager, Kate McMann. Things get complicated when he falls in love with her. HOME FOR CHRISTMAS was formerly published as A CHRISTMAS LEGACY, part of a series for Harlequin, and is now revised as a stand-alone novel. BECAUSE IT’S CHRISTMAS: To most people in town, high school principal Seth Taylor is a hero. But Seth has never forgotten the mistakes he made years ago with his students. And neither has Lacey Cartwright, because one involved her brother. But attraction then love flares between them and Lacey fears she’ll she lose what’s left of her family.